The theme continues to develop, the feeling of macroscopic or microscopic increasing with this eleventh addition to the series. 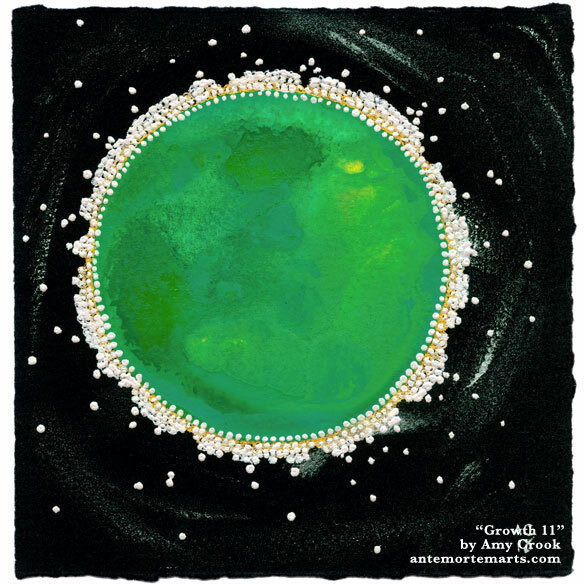 A bright green central circle is surrounded, edged and even intruded upon, by metallic dots that stand out from the page. Everything has texture and weight, a presence that makes it fascinating to move in the light, to run fingers over. There are three layers of gold under the dots, from a deep gold near the center through nearly silver. What do you need to support your growth? 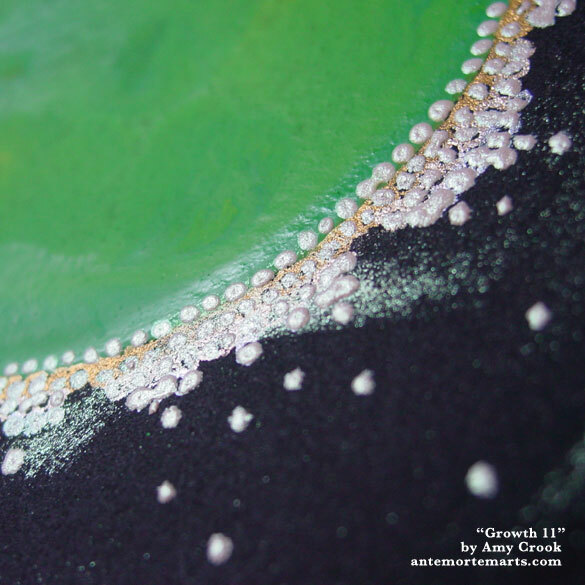 Above, you can see the little pearls of green and gold up close and personal. 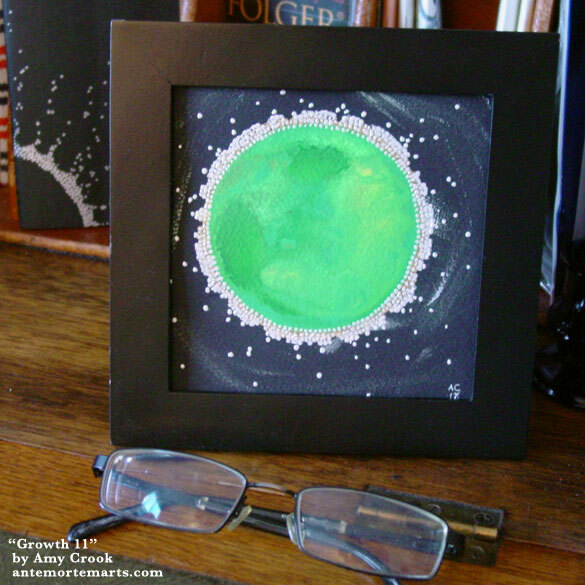 Below, the piece is in its tiny frame, already trying to outgrow its confines. 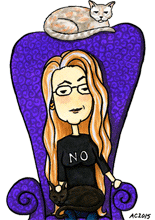 It’s inevitable, living near San Francisco as I do, that I would revisit the Painted Ladies theme. This time a soft, seafoam green permeates the beautiful Victorian row houses, each with a unique facade that nonetheless echoes its neighbors. 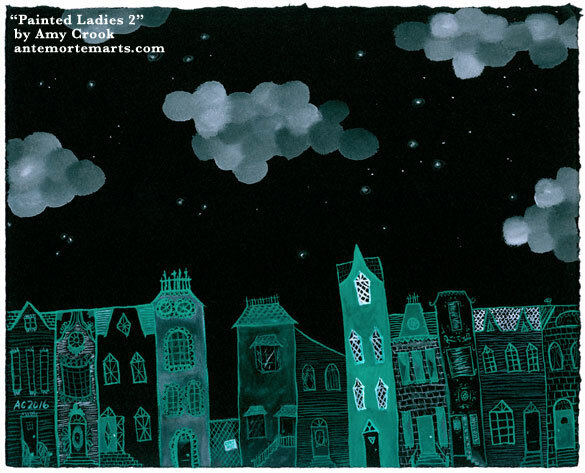 The clouds above look like cotton puffs, fluffily floating along among the shining stars in the velvety black sky. 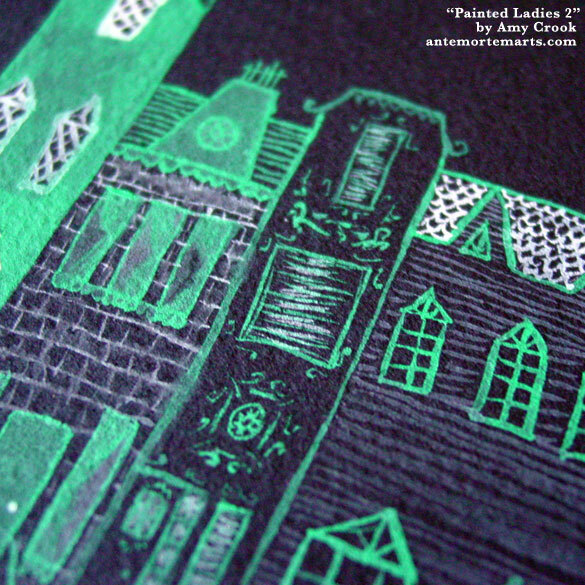 This paper is unique because it gets its color from a chemical process, so the black is lightfast. Though of course it’s never a good idea to put artwork in a sunny spot, it’s good to know it won’t become grey over the years. Above, you can see a close-up of a few of the charming faces on the painted ladies. 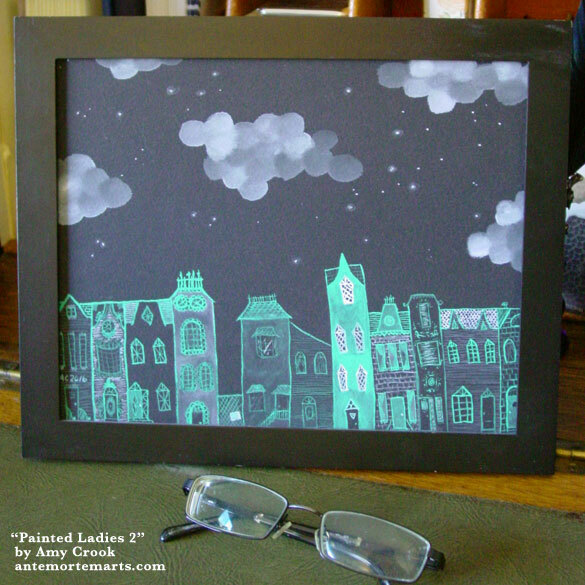 Below, they’re tucked into a simple frame, just waiting to add charm and elegance to your home. Click here to get a bigger view of these two paired paintings! 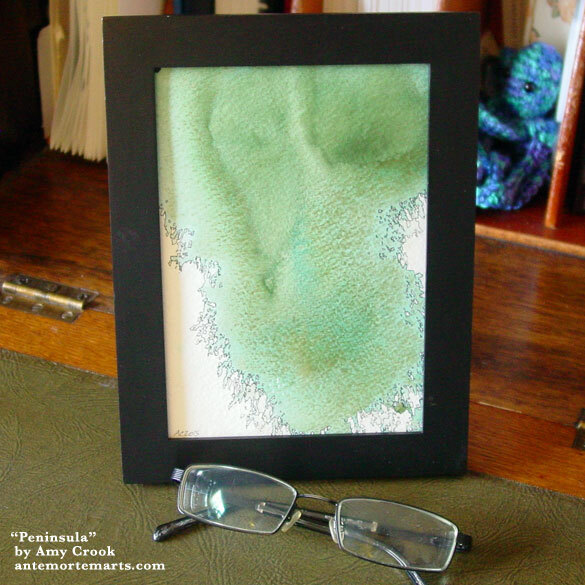 Beautifully abstract, this diptych reminds me of algae blooming in a sunlit pond, mysterious clouds of green moving in the clear water. These would be perfect for adding a splash of brilliant color to one of those awkward spaces in your home. You could hang them above a doorway to help give you reasons to look up more. 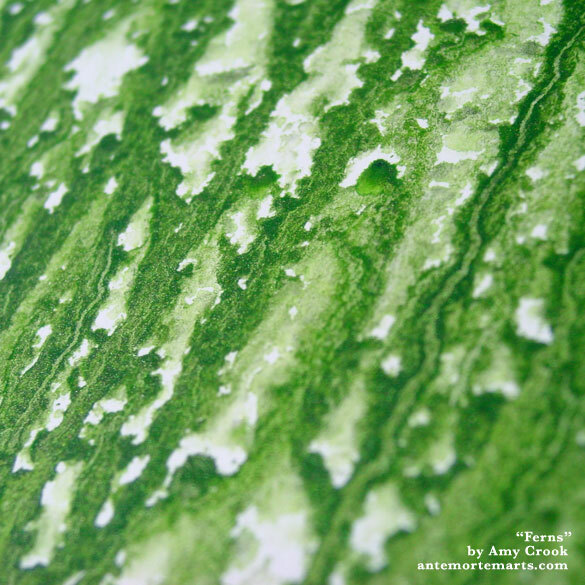 Above, you can see the beautiful movement and gorgeous green color up close. Below, these two paired paintings are together in frames, waiting for just the right wall or shelf. 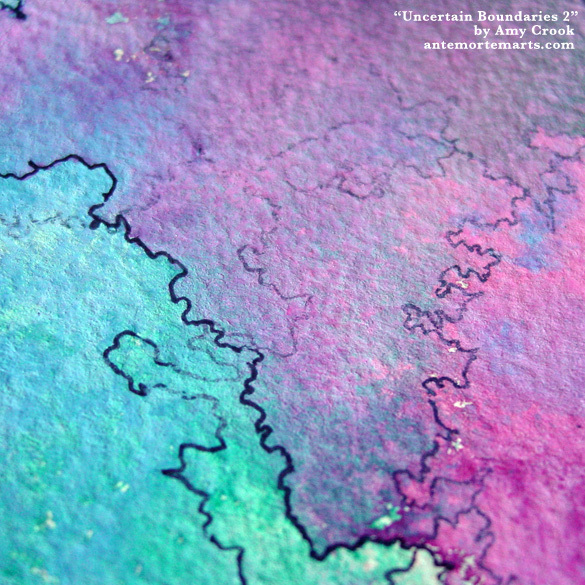 The penultimate piece in this month’s Gallery is another in my Map series. The delicate changes from paper to watercolor become stark with black ink outlining each little eddy and fjord. Although the paint is entirely non-shiny in this one, the nature of the sharp lines makes the land mass appear limned in a pale blue light. 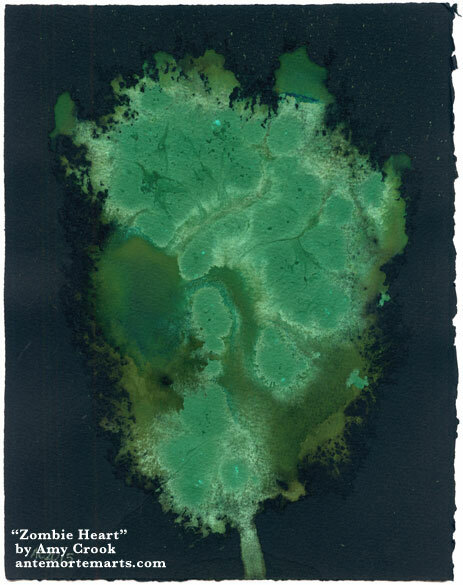 The granulating paint has settled into mountain ridges and smaller hills, forests and plains, creating a topography that exists only between the imagination and the page. Where will this map take you? 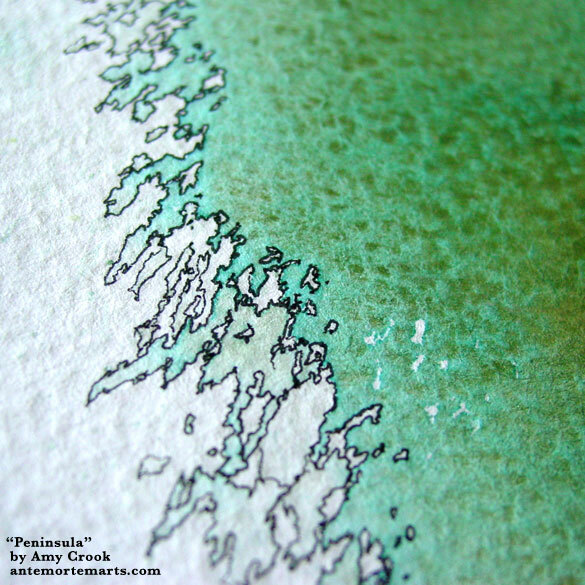 Peninsula, 5″x7″ pen & ink and watercolor on watercolor paper. Above, you can see some of the exquisite detail created by the texture of paper and paint, and the fine lines of pen and ink creating borders around each little shape. Below, the map sits in a frame, awaiting a new adventurer. Although Zombie Heart is in keeping with the Halloween theme, there’s a gorgeous complexity to it that could live in the right home year round. The greens range from the darkest shadow around the main shape to the iridescence that floats above, shining like radioactivity. 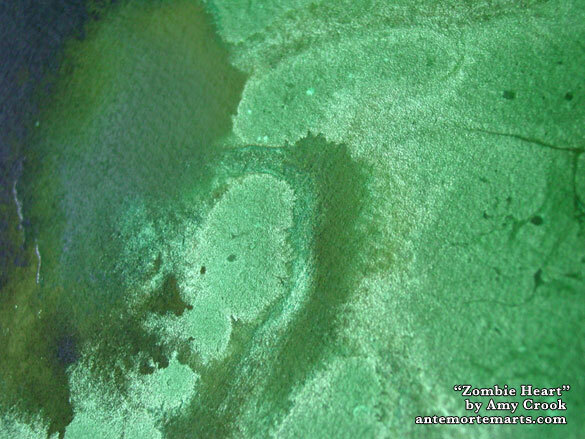 The way the metallic greens bloom on the dark green core shape is like mold blossoming against decaying zombie flesh. The organic layers of shape and shade show an eerily beautiful side to this particular undead myth. Are your favorite zombies created by magic, radioactivity, a virus, or some mad scientist? 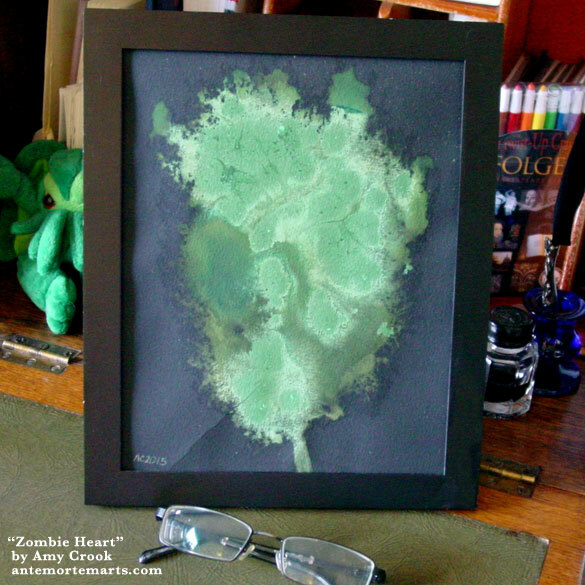 Zombie Heart, 8″x10″ watercolor and duochrome watercolor on Arches cover black paper. 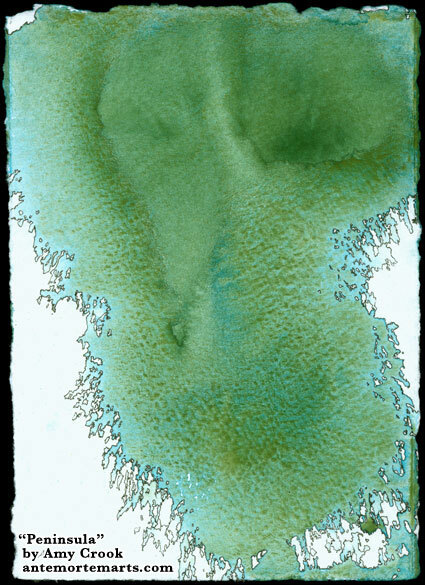 Above, you can see the mysterious swirls and shimmers giving depth and texture to the painting. 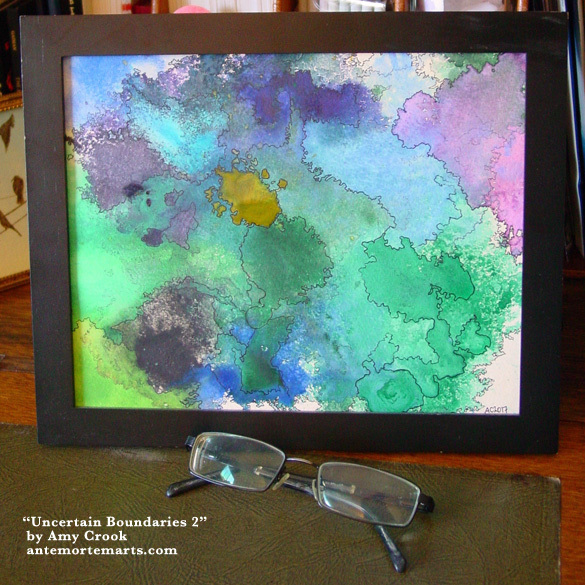 Below, it’s lurking in a frame, waiting to find a permanent home, lab, or specimen shelf. A snail’s-eye view of ferns unfolding above you like a forest, full of strange detail and secret sparkle. 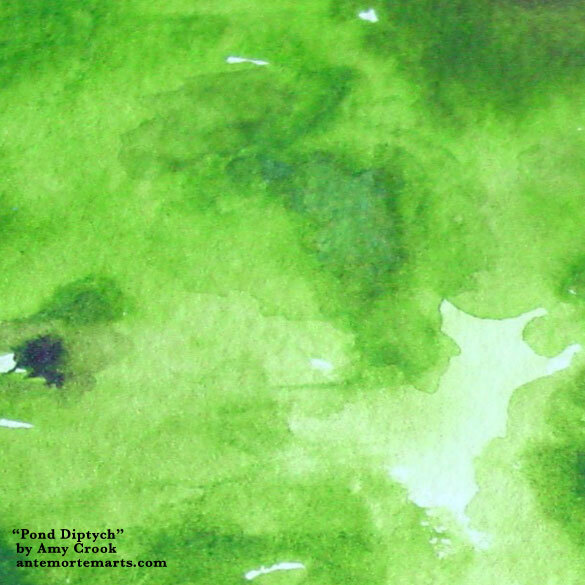 The green is a mix of deep Jadeite, mysterious Duochrome Tropic Sunrise, and two different yellows, bringing a bright, new-leaf quality to the foliage. The paint lies thickly on the paper, runnels carved into it like veins in the long leaves, the green settling out to let the sunny yellow undertones shine through. The sparkle is only really visible in strong light, a secret bit of magic like pollen dusting the leaves. 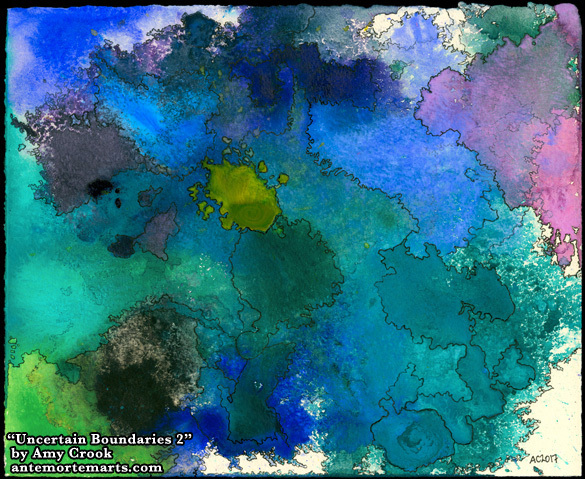 I’ve done a lot of greens and blues in my Pathways series, perhaps next time I’ll go boldly into the warm end of the spectrum. 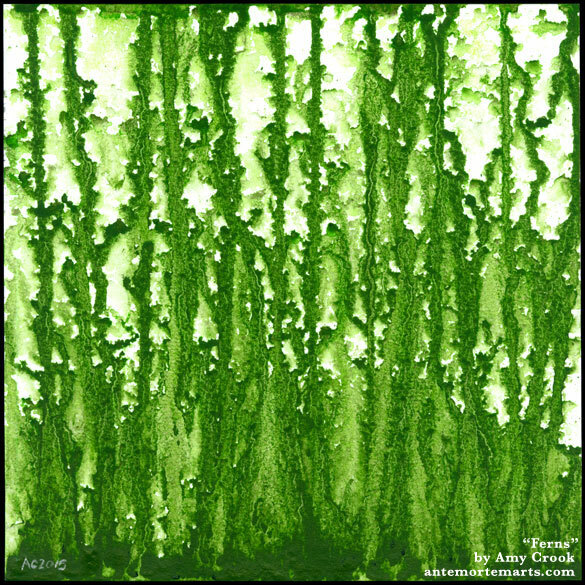 Ferns, 8″x8″ watercolor and duochrome watercolor on Fluid watercolor paper. 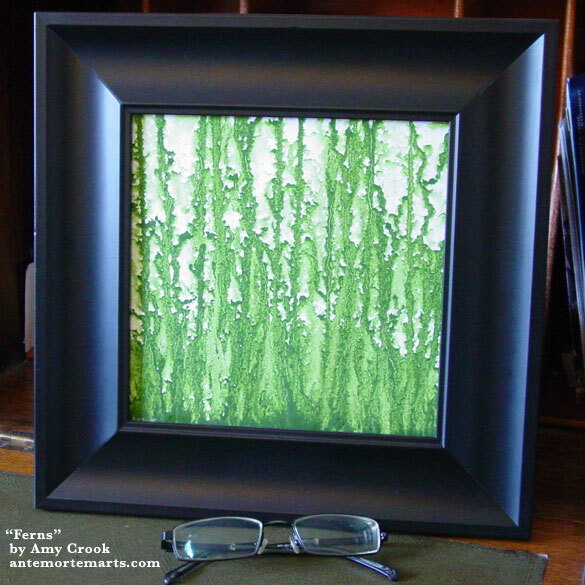 Above, you can see the delicate veins running through the ferns, and the tiniest sparkle of the paint. Below, the ferns are overrunning their terrarium, er, frame.